Small muscular appendage, long and retractable, having a tactile role. Large elongated muscular organ forming the lower portion of the snail and containing the head; it allows the snail to crawl. Thin irregular protuberance of the whorl of the shell, corresponding to its successive growths. Anterior portion of the foot of the snail containing the main sensory organs. Anterior cavity of the digestive tract having a jaw and a rough tongue (radula) to graze on plants. Large muscular appendage, elongated and retractable, bearing an eye at its terminal end. 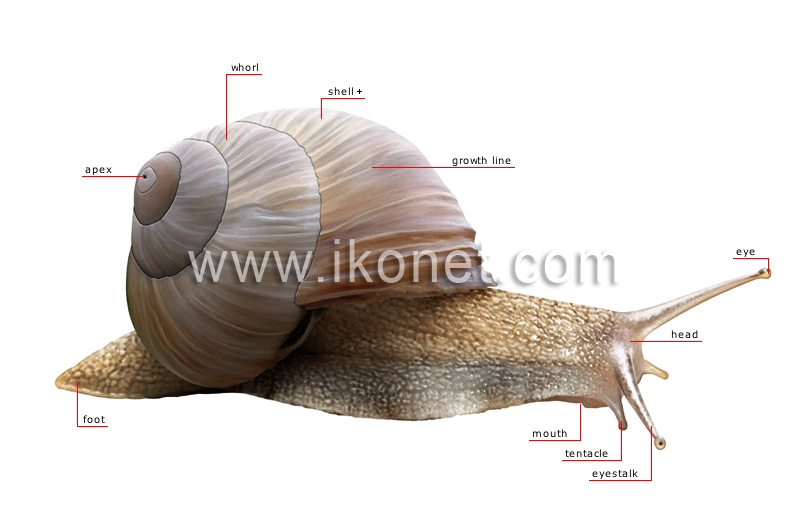 Organ of vision located at the terminal end of the eyestalk; the snail has poor eyesight. Calcareous spiral casing formed of three successive layers that protect the organs; the snail can withdraw into its shell. Each of the swirls around the apex; they increase in diameter and form the shell.